What’s so great about the Great Bear Rainforest? A new documentary for IMAX and giant screen theatres that premieres on February 15 offers armchair travellers a giant window into this pristine British Columbia wilderness. Narrated by BC’s own Ryan Reynolds, the film showcases the only corner of the planet where you can spot the elusive white Spirit bear. Directed by award-winning storyteller Ian McAllister, Great Bear Rainforest goes way off the beaten path to reveal a land of grizzlies, coastal wolves, sea otters, and more. Found on Canada’s remote Pacific coast, it encompasses a quarter of the world’s coastal temperate rainforest. The area has been home to Indigenous peoples for thousands of years. Enter the Great Bear Sweepstakes by May 9, 2019 for a chance to win one of two trips of a lifetime in celebration of the launch of a spectacular new film for IMAX and giant screen theatres. The winners will spend either 10 days aboard the Columbia III with Mothership Adventures, or five days at Spirit Bear Lodge. Everything in the rainforest is connected, a cycle of life in perfect balance. No wonder so many people—lives entrenched in technology, disconnected from nature—are drawn to its tranquility. Ready for the trip of a lifetime? Here’s what you need to know before you go. 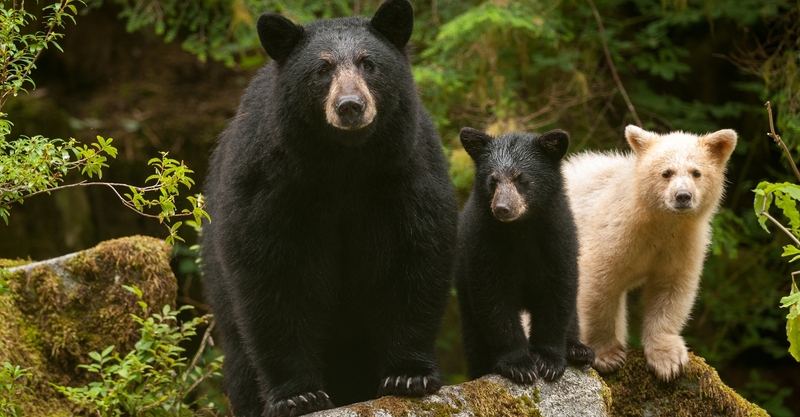 British Columbia’s wilderness inspired the Great Bear Rainforest film. Find out how the big screen can lead to real-life adventure in BC with these travel ideas. Looking for some of the best places in BC to gaze up at the night sky?